Yahoo has rolled out its new-look search page – ready for the forthcoming collaboration with Microsoft's Bing. 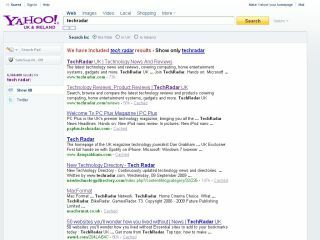 Yahoo's new look search moves some of the modules around for a cleaner more modern look. That includes adding a discovery bar below the search box and a left hand side navigation column - very reminiscent of Bing. The increased functionality is certainly not to be sniffed at – especially coming from a results page that was certainly showing its age. And when the eagerly awaited 'powered by Bing' label makes its debut, we can all begin to wonder if Yahoo's new look can steal back some of its old audience, or if Microsoft will begin to edge into second place.